Albert “The Chief” Hurt comes from a long line of automobile mechanics. His grandfather, father and all his uncles worked as mechanics in the family shop. At the age of 12, Albert earnt his pocket money by sweeping the shop floor. 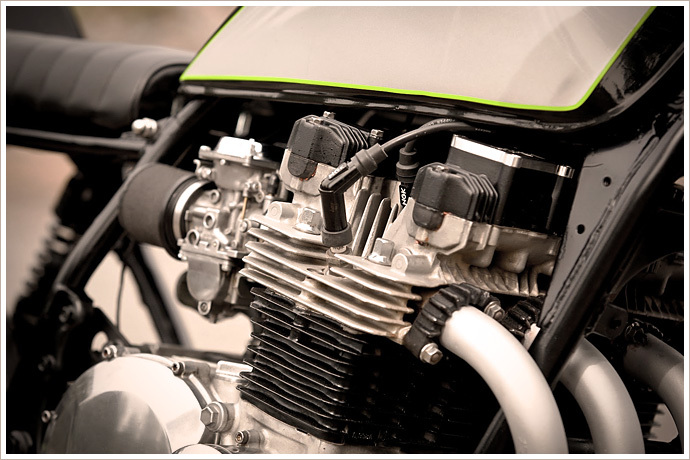 “After I had worked there six months I was able to scrape up enough money for my first street bike, a 1972 Yamaha DT1 250,” he says. 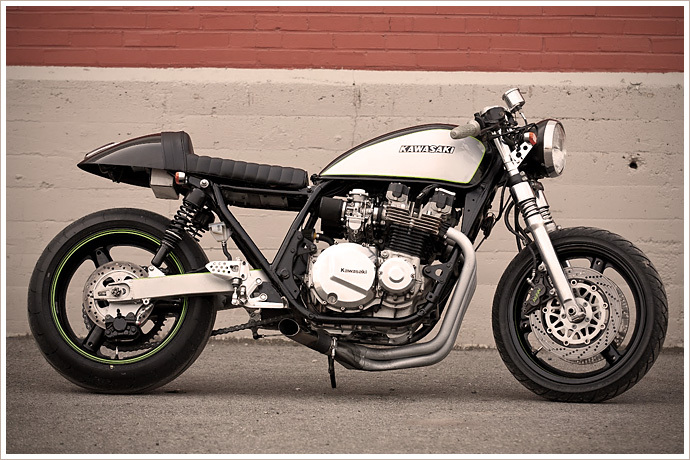 There have been many bikes since then, but it took a marriage breaking down and being diagnosed with stage 3 cancer to really motivate Albert to build his dream bike. “I have found a passion that I always had,” he says. 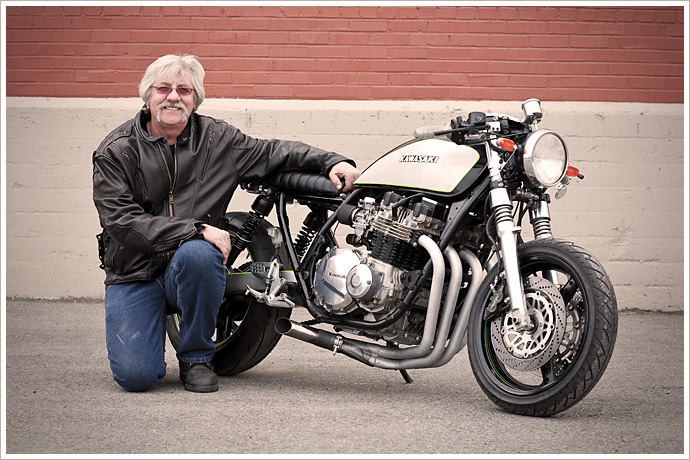 After surviving his battle with cancer, Albert decided to build the ‘ultimate cafe racer.’ So he got to work and managed to find the perfect donor bike, a beat up old KZ1000 in El Paso, Texas. After 7 months of wrenching, including many nights in his garage during winter he has finally finished. 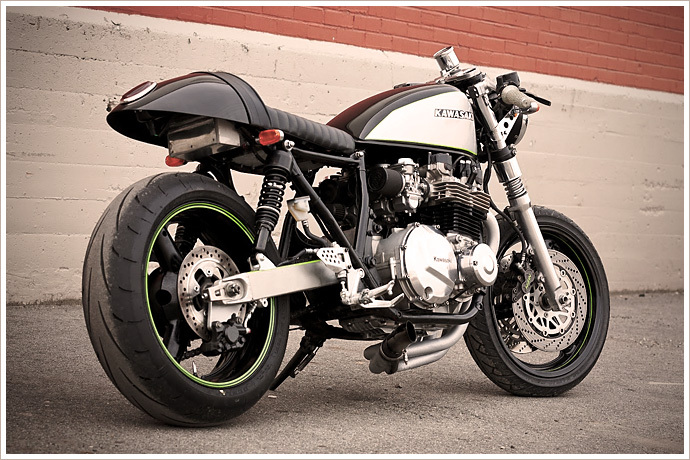 We’re pleased to introduce you to Silver Bullit Cafe’s KZ1000. “I wanted to have the ability to properly stop the beastie. 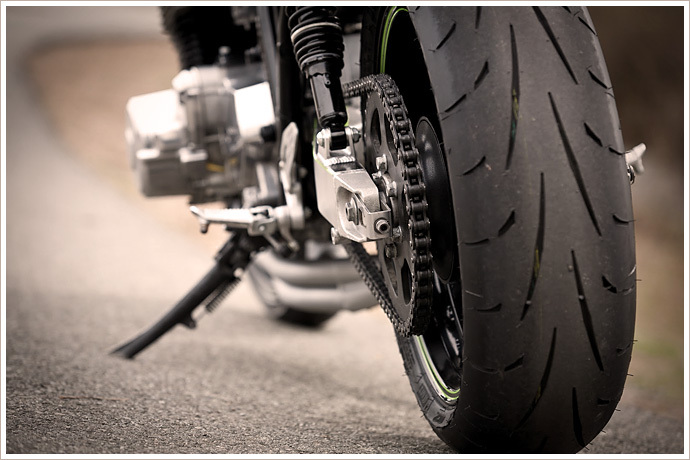 The brakes have more than enough power to bring the KZ1000 to a halt in short order. I have some new stainless brake lines from Galfin ready to install. The bike is very low with the Suzuki suspension. The tire and rim in front are a 16″ while the rear is a ZR1 17″ fattie. 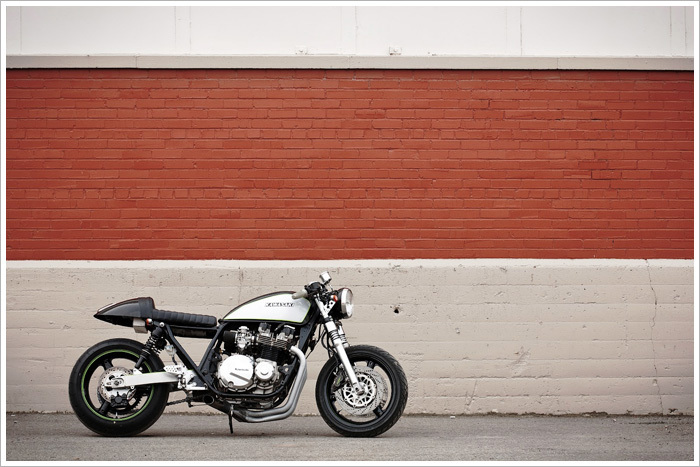 The Kawasaki green striping on the tank and wheels off set the black. 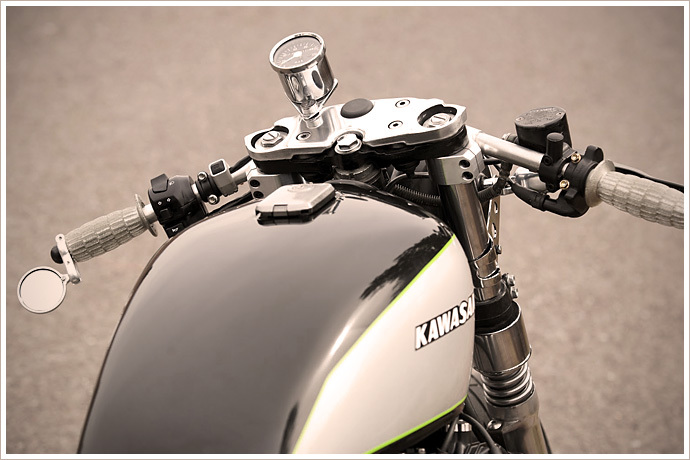 The controls are a combination of aftermarket parts from Drag Specialties, Dime City and KZ1000. It’s been six years now and Albert is still cancer free and he has already built six bikes this year. It’s proof that great things can come out of bad situations. Not only does Albert have this beautiful KZ1000, he has also found a new lady in his life – we couldn’t have written a better ending. 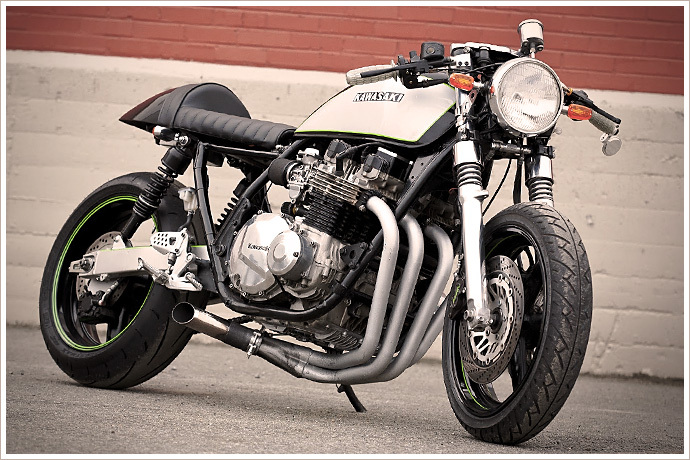 “To all cancer survivors this bike build is for you and your caretakers. Fight the good fight and hang in there; never give up,” he says. For the complete story visit the Silver Bullit blog or to hire Alberts wrenching skills visit the shop site.